Along the coastal road from Chios city to the north, we arrive at VRODADOS. Most of its inhabitants are sailors. In Vrodados, there is the Museum of "Philoproodos Association", in which objects of maritime tradition are displayed. 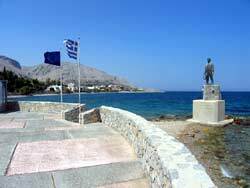 At the seashore, there is a statue dedicated to the unknown sailor and the Daskalopetra (Homer's Stone). In this place, according to the tradition, Homer taught his students. The monument is a flat, circular rock, curved on the top. Around the rock, the visitor can see the curved seats used by the students.However, the scientists tend nowadays to support that Homer's Stone is rather a cubic altar, thus an open-air temple dedicated to goddess Kyveli. Further on, above the sea, there is the grave of Yiannis Psiharis, the famous linguist. Continuing our way, we meet the manastery of Mersinidi and the Glari beach and the enchanting fishing villages of Pandoukios, Lagada, Ano and Kato Kardamila.